More students are immediately taking college-level math and English at UH, inclusive of credit earned in high school. The recently published College and Careers Readiness Indicators Report released by Hawai‘i P-20 Partnerships for Education shows a steady increase in the number of students who have earned the DOE’s Honors Recognition Certificate. The Class of 2018 also included more students who took the Advanced Placement exam. More than one fourth of the graduates in the Class of 2018 statewide earned a Hawai'i State Department of Education's (HIDOE) Honors Recognition Certificate, completing a rigorous course of study to prepare them for college and career. To receive an Honors Recognition Certificate, students must meet all of the requirements for a Hawaii high school diploma with a minimum cumulative grade point average of 3.0 and complete additional, rigorous requirements such as earning additional credits in math and science and meeting or exceeding performance-based assessments. The recently published College and Careers Readiness Indicators Report (CCRI) released by Hawai'i P-20 Partnerships for Education shows a steady increase in the number of students who have earned the HIDOE's Honors Recognition Certificate; 28 percent in the Class of 2018, up 10 percentage points from 18 percent in the Class of 2016. The Honors Certificate program was introduced in 2016, the same year that graduation requirements for all students were made more rigorous with the implementation of Board of Education Policy 102-15. Even with the enhanced graduation requirements, the on-time graduation rate for the Class of 2018 increased to 84 percent from 82 percent for the Class of 2013. The CCRI reports show that the collaboration between the University of Hawai'i System (UH) and HIDOE to strengthen the education pipeline is yielding positive results. Eighteen percent of students in the Class of 2018 enrolled in college courses while in high school, an increase of 12 percentage points from the Class of 2013. In addition, more than half of these students earned at least six college credits, saving on future college costs. 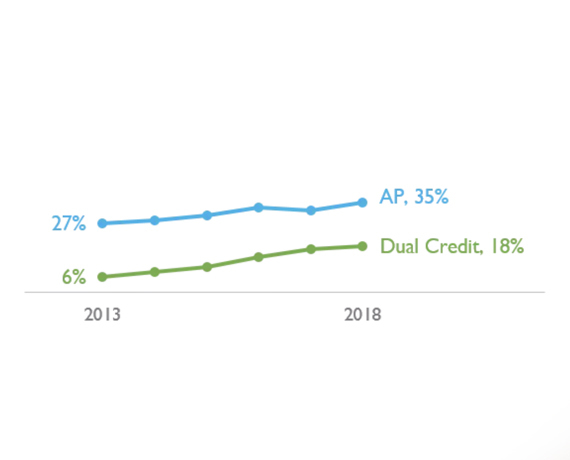 The percent of completers taking an AP exam has steadily increased and participation in dual credit has tripled. The Class of 2018 also included more students who took the Advanced Placement (AP) exam in high school; 35 percent for the Class of 2018 compared with 27 percent in the Class of 2013. High school completers who scored at least a 3 on an AP exam increased by five percentage points for the Class of 2018 from the Class of 2013. The AP exam is designed to measure students' mastery of AP courses and can earn students college credits. "Given the opportunities and the right supports, our students are driving their success and attaining and demonstrating more rigorous learning in greater numbers," said Superintendent Dr. Christina M. Kishimoto. "I want to especially congratulate them, as well as our educators, extended support staff, families and communities who support them. These results validate the work of our ongoing partnership with UH to ensure students are prepared for opportunities after high school." For more than a decade, UH and HIDOE have collaborated to strengthen alignment between high school and college, so that more students make a successful transition to postsecondary education. The collaborative efforts have included reviewing and revising placement policies at UH campuses to allow students to be placed into college-level courses based on their achievements in high school. Taking dual-credit courses that allows high school students to earn both high school and college credits while in high school, and a number of other efforts designed to boost student achievement and success in higher education. 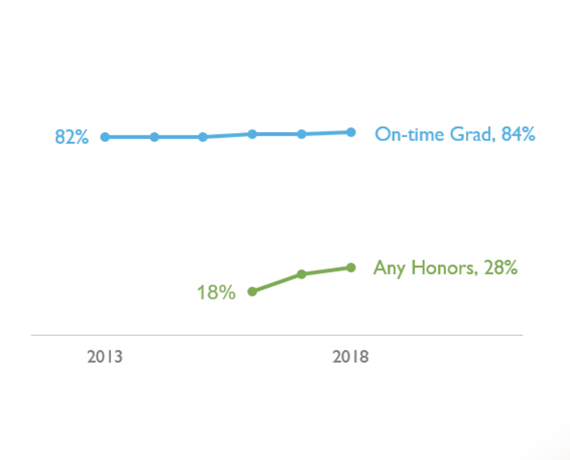 Despite more rigorous graduation requirements, a higher percentage of students are completing high school on time and earning honors certificates. "We are thrilled to see that Hawai'i's public high school graduates are more prepared for college than ever, and I encourage these high school graduates to consider which UH campus will help them meet their career goals. We had the largest ever first time freshmen enrollment at the University of Hawai'i at Mānoa in history, and we hope that trend continues for all of the UH campuses," said David Lassner, president, UH System. Increased college enrollment to 44 percent for the Class of 2018 from 33 percent for the Class of 2013, an increase of 11 percentage points. Increased enrollment in college-level English courses to 74 percent for the Class of 2018 from 38 percent with the Class of 2013. 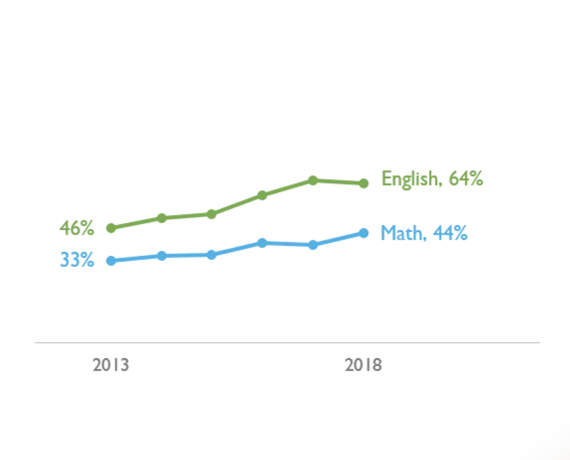 Decreased enrollment in below college-level math and English courses to 4 percent for the Class of 2018, from 46 percent for the Class of 2013; down 42 percentage points in both math and English. More than half of the Class of 2018 earned a HIDOE Honors Certificate, an increase of 10 percentage points from the Class of 2016. 58 percent of students in the Class of 2018 took AP exams, an increase of 26 percentage points from the Class of 2013. Increased four-year college enrollment to 58 percent for the Class of 2018 from 44 percent for the Class of 2013. Increased the number of students taking dual credit courses to 31 percent for the Class of 2018, from 8 percent for the Class of 2013. Leads the state with the highest increase in high school completers earning six or more dual credits; 26 percent for the Class of 2018, up from 3 percent for the Class of 2013. Increased enrollment in college-level math at UH by 25 percentage points, from 34 percent for the Class of 2013 to 59 percent for the Class of 2018. Increased college enrollment to 71 percent for the Class of 2018 from 60 percent in the Class of 2013. Increased the number of students taking AP exams to 45 percent for the Class of 2018 from 33 percent for the Class of 2013. Hawai'i's CCRI reports are continuously recognized by national organizations, including the Data Quality Campaign, Achieve, and the National Governors Association, as a leading example of collaboration between K-12 and higher education and for providing useful information on college readiness. The full reports can be found here and also here. Reports can also be viewed on Hawai'i DXP's interactive dashboard here.